Replenished by a hearty breakfast spread of oatmeal and fresh fruit (pineapples, mangos, bananas), the ‘engineering contingent’ of our team crammed into a flashy red pickup truck and set out for our most critical mission of the week. 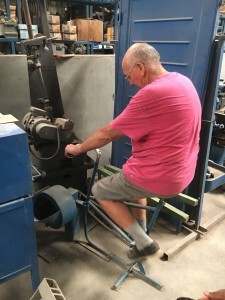 Having spent much of our previous days testing our shredder design, constructing a wooden stand and demonstrating its functionality to Ralph and Dayana, it was now time to take our design to a local trade school. 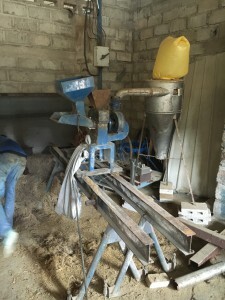 For our vision to be realized, it is essential that we build local partnerships that can provide the resources, skilled labor and cultural know-how required to implement a sustainable briquette-making program. 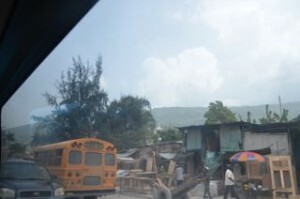 Leaving the densely populated main streets of Les Cayes, we entered the more rural countryside on our way towards the trade school. Passing by market stands, grazing fields and rice patties, we took an abrupt left turn down what had to have been the bumpiest, rockiest, sorriest excuse for a road I’ve experienced in a looooong time. To our great relief, the trade school Ateliers Ecoles in Camp Perrin soon emerged from the among the trees. 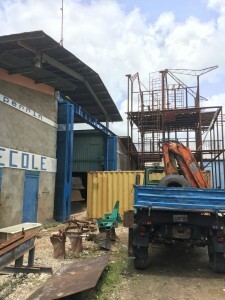 Towering warehouses dwarfed the surrounding vegetation as dozens of Haitians moved to and fro constructing metal frames for a school building, welding giant metal pipes and (as expected) staring at us, the strange new visitors. They reciprocated our enthusiasm for partnership in the creation and implementation of future solutions. We left this fruitful introduction feeling very hopeful for the future opportunities this partnership. 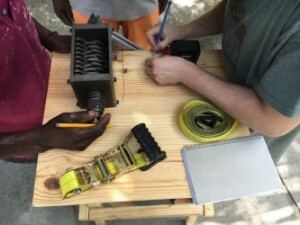 We hope to work through Ralph and Dayana in the upcoming months to refine our shredder designs and see our next model fully manufactured in Haiti. Yesterday was our last day of school. Our activities of the day were the same as they were on Wednesday but with Dr. Laycock, Andrew, and Dayana constructing Martian Landers and Ralph and I talking about survival on Mars. After sharing ideas between the teams, the final day was even more successful than the day before it. Both groups were able to charge my fitbit with solar energy (much to my pleasure), generate oxygen using electrolysis, land many of their astronauts successfully, and several students even claimed to hear some static with the crystal radios they made. Even more importantly, the students demonstrated their capacity to learn, and retain, the scientific content that we were teaching when they used some of the knowledge that was talked about last year to help inform their decisions this year for the temperature activity. I am truly in awe of how intelligent the students are and how enthusiastic they are to be learning. I couldn’t be happier that they enjoyed the activities that I helped to create. After our final activities were over, Fr. Lesley invited us to have a lunch with him and several members of his staff in our honor. 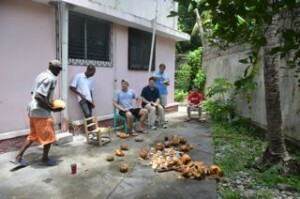 I am completely humbled to have a lunch in Haiti that occurred thanks, in part, to some actions that I did. Further, Fr. Lesley did an amazing toast that was quite moving. As a token of our friendship with the school, we exchanged signed posters. 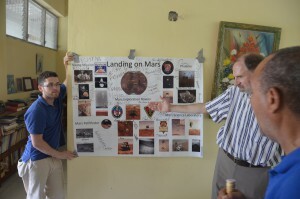 The lander activity used posters to illustrate the different means of landing on Mars. During one of the sessions, Dr. Laycock had the ingenious idea of having the students sign the posters so that way before we left, Fr. Lesley and the team could sign and exchange the posters so that each group had a copy as a symbol of our cooperation. 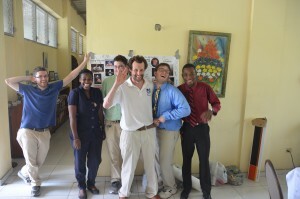 The experience of teaching the Haitian students is something that I will never forget. I am honored to have had this opportunity and want to thank everyone that made it possible. 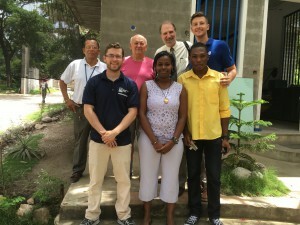 Thank you Dayana and Ralph for helping us lead the lessons and translating for us, Dr. Giles and Connie for having the center be possible, Dr. Lewis for helping me come up with ideas for activities, Andrew for providing technological advise and expertise to advance the activities, Fr. Lesley and his staff for opening up the school to us, and last, but certainly not least, Dr. Laycock for choosing me to join him on this expedition and for trusting me to help make the activities. I hope to be back again. Mars was the orange beacon among the stars of Scorpio, just rising above the palm trees in the East, Saturn hiding in there somewhere closeby, Jupiter directly overhead in Leo, and the crescent moon glowing low in the West. 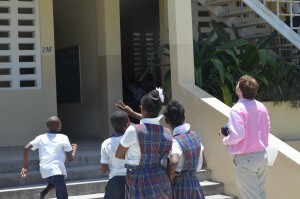 A perfect parade of planets for the first Les Cayes – UMass star party at Sainte_Marie des Anges school. 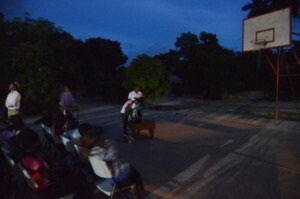 As dusk came on, a large block of chairs were arranged on the basketball court, two telescopes set up, and children and their parents (mostly fathers) began to arrive. We had wondered if anyone would show, and were pleasantly surprised (if a bit overwhelmed!) by the turnout. Was I ever glad I’d scouted out the sky the night before, and memorizing my “sky tour” – can’t have people knowing that we astronomers don’t carry the current position of all celestial bodies in our heads at all times! 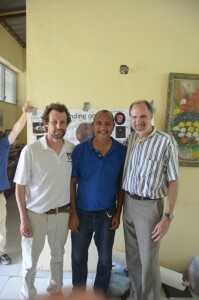 As 7pm arrived Ralph and I began our spiel – working closely with this accomplished Haitian astronomy expert was a blast. Somehow he was able to keep an engaging banter going between us all despite my infamous language skills. The audience had so many questions, and were eager to look though the long-touted telescopes. They were not disappointed, as the narrow crescent showed many mountains, craters and ranges along the terminator– plus a spectacular impossible-seeming peak at the moons pole, poking up into the sunlight from the shadowed side. The audience had to wait patiently for everyone to get a look, but it was beautiful evening and everyone sat or chatted in small groups. 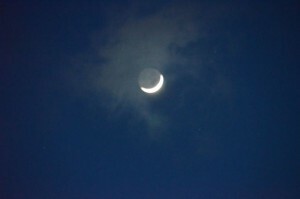 A pale owl and several bats flew above us. Some of the younger kids had to be lifted up to the eyepiece or stand on the table -something we all got an added kick from! 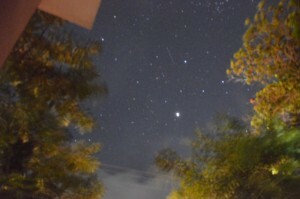 Dayana and Tom were busy with a second telescope trained on Jupiter while Andrew took pictures of the night sky. In between bands of clouds we explored Jupiter and it’s moons, we discussed the various constellations along the ecliptic, counted the stars in the Dipper to find the Alcor-Mizar double. My claim of 7 stars being quickly overruled by a group of girls that counted 11 – all agreed it was due to the much more beautiful skies of Haiti compared to Massachusetts. By “home time” we had thoroughly discussed the finer points of interplanetary flight (how fast – how many times faster than a bullet? How DO you slow down again? How long does it take? – everyone still wants to go! ), the latest news from Mars and the prospects for life in the solar system. Several kids and parents had clearly come armed with questions they wanted answering, and were not leaving without getting satisfaction! One of the most engaging and interested audiences I‘ve presented to anywhere. 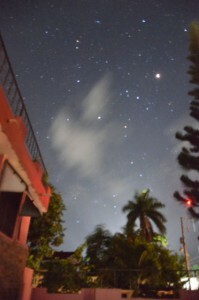 After the kids had left, this being Haiti we *had to* put the party in star party! -a little late-night round of champagne with Principal Fr. Lesly and his staff. Prof Giles gave a fine speech and only half soaked the scene with his celebratory uncorking technique….. The students have surprised me with their enthusiasm and interest in the material. 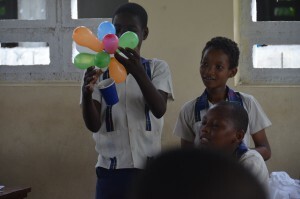 They performed all the activities we gave them vigorously and successfully – even the greatest challenges were met. 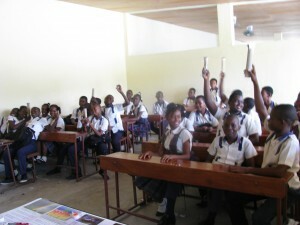 They have been (reasonably) attentive through all classes, and asked excellent questions. Space seems to fascinate them – dozens of students came to the star party last night, and many asked questions about what exploring other planets (or expressed interest in becoming astronauts). It is sometimes hard to believe that these are not American students (although the intense heat never fails to remind me that I am not in Massachusetts). It seems wasteful that they are denied so many of the educational opportunities available in the United States. I have no doubt that they would thrive in any academic environment – it is a privilege to work with them. Today’s trip to school simulated a trip to Mars. After last night’s star party, the students were all riled up and ready to learn about the Red Planet. Due to material constraints, we had to run to separate activities but both entailed researching Mars. Andrew, Dayana, and Dr. Laycock presented an activity about living on Mars. The activity started with students ranking all the planets, and a few everyday objects like ice and soup, based on their temperature so that they knew how cold it would be if they had to live on Mars. That led off on a discussion about atmospheres and how the atmosphere of Mars compares to that of the Earth. At this point, the team illustrated what happens when water interactions with certain kinds of rocks on the surface of Mars, simulated by baking soda, to show why Mars has an atmosphere largely of carbon dioxide. From that point the students were tasked with making sure that oxygen could be produced, electricity made, and that people could communicate if they were on Mars. 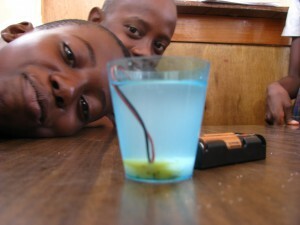 The students making oxygen had to use electrolysis to separate water into hydrogen and oxygen. 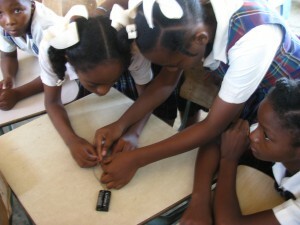 The students generating electricity implemented solar panels to charge batteries. 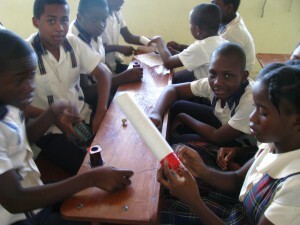 Finally, the students tasked with communication had to build a crystal radio. We are happy to say that all criteria for immediate survival were met! Ralph and I had students attempting to land astronauts on Mars. To begin the activity, we discussed Spirit, Opportunity, Curiosity, the Phoenix Lander, Pathfinder, and the Viking Landers and how they were able to successfully land on the surface of Mars. We had students look at pictures and cards of retro rockets, parachutes, airbags, and the sky crane (used to land Curiosity). Then students were tasked with designing and building a lander of their own that wouldn’t injure our plaster astronauts and they had to do so on a budget of $500 in monopoly money. All items available to be used had a price, even the tools like scissors and tape. I was so impressed with all the different designs and ideas that were produced by the students. I was even more so impressed with how little some were able to spend. While a few astronauts hit a rock on landing or fell out of the lander, a majority made it safely to the ground. While we may have been a little boisterous at times, the sharing of thoughts and ideas was truly what produced the great designs of the landers. I look forward to what tomorrow has to offer. 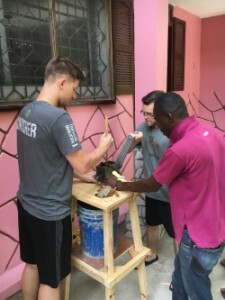 Sean Hays and myself spent the day putting the finishing touches on the table that our biomass shredder was mounted on with the help of a skilled Haitian carpenter. Testing of the shredder began immediately after the table’s completion. Coconut husks, leaves, and branches were all tested and were successfully shredded. The next steps Sean and I will be optimizing the efficiency of the shredding process and installing a hopper. We will also be investigating the optimal methods of preparing the biomass for shredding as well as discovering which materials burn well as briquettes. Today was the first day of school, not for the students but for the instructors. 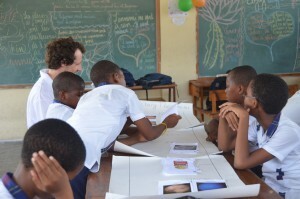 Andrew, Dr. Laycock, Dayana, Ralph, and I went to the a local school in Les Cayes to teach the students about light. The activity of the day was to make cardboard spectroscopes to view the visible light spectrum. 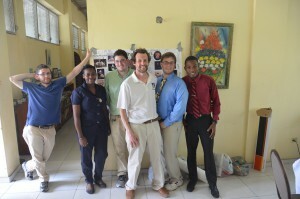 The teams were Dayana and Andrew and Tom and Ralph with Dr. Laycock helping out where needed. 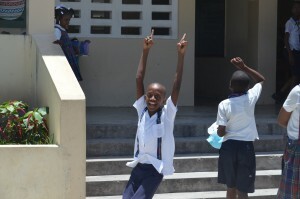 The students were excited and ready to learn. 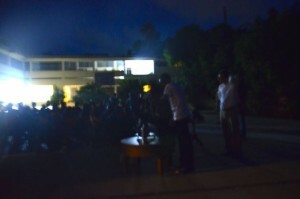 The activity began with the students sharing their ideas about light and what they already knew. Then we talked about waves and the electromagnetic spectrum. Students then tried to put together spectroscopes using card board tubes, different diffraction gratings, index cards, tape, paper, and scissors. 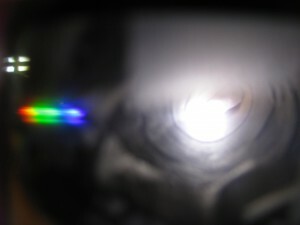 While students needed some guidance from time to time, they all were ultimately able to construct successful spectroscopes that could separate white light into its spectrum. Throughout the activity, we also talked about how diffraction gratings work, why white light is able to be split, and how spectroscopes can be used for astronomy. I am pleased to say that the students were able to answer all my questions at the end of the activity. I was so impressed by what the students were able to accomplish in an hour and a half. They truly demonstrated how smart and ready to learn they were. I look forward to tomorrow’s activities. 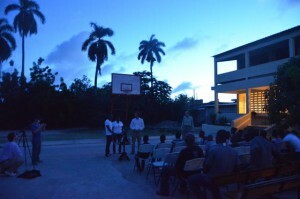 Tom: As the week moves along, we are now starting to get into the work that we came to Haiti to do. 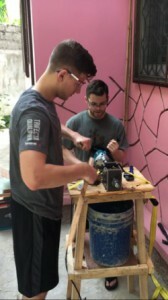 Sean and Mike are beginning to experiment with their chipper and Andrew, Dr. Laycock, and I have started organizing our materials for the outreach activities that we will be doing in the coming days. We also go the pleasure of meeting, or in seeing again for some, Ralph and Dayana yesterday. Without them then our activities wouldn’t be possible and they are the reason that we are able to do anything at all here in Haiti. They will be our translators, our guides, and our friends over the course of the week. While we may have begun to work, we have still been having our fun. A second night of spades brought even more enjoyment as we tried playing in teams. Ultimately, Dr. Giles and I may have lost to Andrew and Sean but at least we managed to beat Dr. Laycock and Mike. 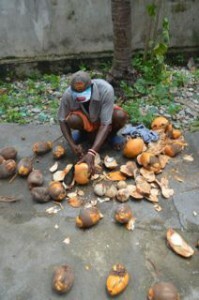 Today we were treated to fresh coconut picked straight from the tree. 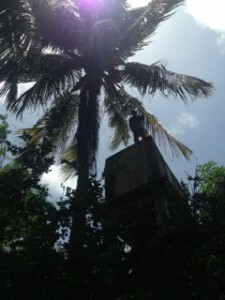 A man climb a tree to drop coconuts and then open them with a machete is certainly something that I will never forget. 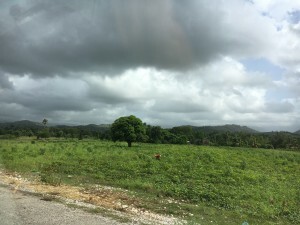 Return to Haiti – a drive through the country. 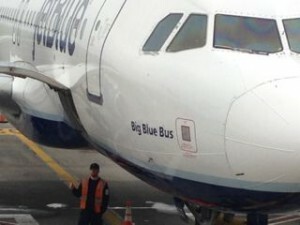 Boarding our direct flight to Port Au Prince (with its name “Big Blue Bus” emblazoned on the nose) I was looking forward to the trip, and hoping that our new crew we’re ready for it. The flight was filled with a mix of Haitians returning home, and a couple of other groups heading down to run clinics in remote mountain areas, and install solar energy systems. As the plane began its decent I glimpsed the familiar scenery: the Turks and Caicos islands with their luxury resorts seemingly a stone’s throw from the deforested and desolate landscape of Haiti. In the terminal a local band was playing a catchy tune, and I felt excited to be back. The warm air was a welcome after the long New England winter and not so warm spring! 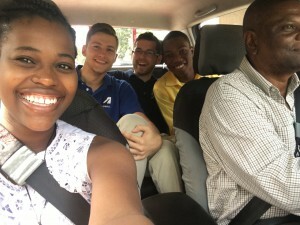 We were met by Stephenson, the driver (and much more) from UMass Haiti development studies center. Stephenson smoothed our way through the throng of men trying to pick up passengers, one “Mr Big” (I kid not, he had a nametag!) being particularly insistent. I remember my rising fear on previous arrivals to Haiti, and Peru. I reminded myself that these are just people trying to make a living, and walked out in to the even more chaotic parking lot following our friend to the waiting mini-van. 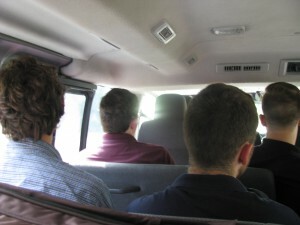 I could sense that our group had mixed feelings, but they all kept a stiff upper lip and soon we were on our way. Into the chaos of PaP with its bustling streets packed with colorful market stalls –or what passes for stalls – but this is not your hipster farmers market. Fruit, old clothes, vehicle parts, roasting meat, live chickens, broken stuff of every description occupied every surface. All of it for sale. Dogs running around, pigs and goats cooling off in the open stream/sewage channels choked with trash. But beneath it all a kind of order and ordinariness could be discerned. Something I hadn’t noticed at all on my first arrival last summer. This is life here, and the people going about their business were clean and clad in clean clothes, they had nicer haircuts than me (although that’s a low bar!). Teenagers chatted with friends, boys gave girls rides on mopeds. The sense of threat and menace that had surrounded me last time was absent. I saw carpenters making doors and chairs, using traditional tools just like my dad, in their open-air workshops. Mechanics fixing cars so wrecked that it was hard to imagine bothering to try. Probably risking their health constantly for lack of proper tools or safety equipment. How do you even get a tire off the rim with no power tools? A large group sat on the ground weaving baskets, hats, but no time to stop and buy any today. We all noticed the sole foreign business – an improbable Mercedes dealership, and the nearby fortified UN compound –whose own website says they will not leave the compound under any circumstances – without armored cars and soldiers – makes me wonder if they’re exactly on the pulse of the nation. As we progressed into the countryside we saw a lot of construction. Always rough cinderblock structures, most with the appearance of having been abandoned halfway through. From work on my own house I could recognize the often frustrating gap between the initial vision and how the job actually goes. I wondered about the families that had imagined moving into a new home. Are they still waiting? Did they move away? Will someone return one day and keep building? 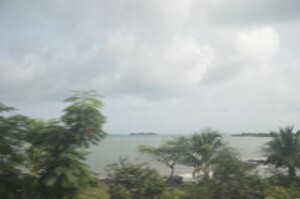 Spectacular views crossing the mountains and rounding the coast. Frequent slow downs for villages where it was always market time. 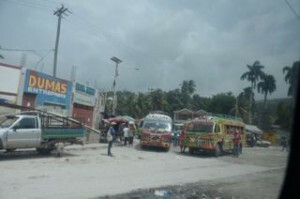 Eventually after 5 or so hours the bus lurched and bumped its way into Le Cayes. A jubilant reunion with our friends at the center. A very different feeling from my arrival a year ago when I had closed the door to our room and told my wife Christine we’d obviously be leaving at first light next day. Luckily we didn’t, and ended up finding a wonderful city, despite its obvious challenges, and many new friends. 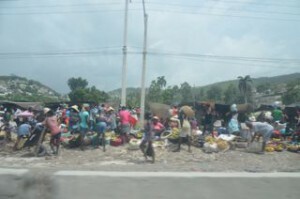 Its only a week and no one has easy solutions to Haiti’s problems. I hope the UMass Lowell students spread the word about Haiti, and continue to build the friendship between our countries.